Rigid Mounting Solutions - Bar Mount UNIVERSAL - Dezod Motorsports Inc - Home of the automotive performance enthusiast since 2002. The Rigid Industries Horizontal Bar Mount includes one mount that allows you to mount any one of our D-Series, SR-M, or SR-Q LED lights to any horizontal tube. 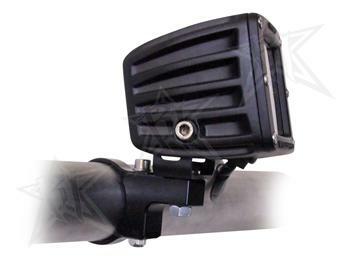 (LED Light is NOT included) This mount is made in the USA from light-weight, black anodized billet aluminum. The Rigid Industries Adjustable Bar Mount Kit includes two (2) adjustable mounts; one for each end of one of our light bars. These mounts are extremely versatile, allowing for up to 1” of adjustment to position your light exactly where you need it. Made in the USA from light weight black anodized billet aluminum.